Alchemy as commonly understood today, is thought to have been a medieval pseudo-science which aimed to change base metals, such as lead, into silver or gold, the discovery of a universal cure for disease and the discovery of a means of indefinitely prolonging life. However, alchemy is not a term easily defined. While it may be common to think of alchemy as seen as a black and occult practice, which was the precursor of chemistry, it should not be viewed in such one dimensional terms. Its foundation lay in the attempt to understand the mystical as well as the material world in terms of a chemical manifestation symbolically revealed in the language of chemistry and as a spiritual path revealed in terms of the epiphany of religious experiences, in essence, similar in nature to Einstein’s theories of the Universe being revealed in the language of mathematics and the spiritual path revealed in the occult art/science of “Numerology”. The common denominator to both interpretations of alchemy is transmutation, the changing or altering of one “element” in form, appearance, or nature and into a higher form, be it a “material” substance or the “immaterial” soul, the transmutation of lead into gold or the transmutation of the mortal body into the immortal. An essential “Holy Grail” for either (or both) of those goals is obtaining the "Philosopher's Stone”, a legendary and magical touchstone or elixir that could perfect any substance or condition, thereby accelerating the evolution of matter or man. In the paradigm of modern quantum physics, the physical Universe is made up of vibrating forms of energy and alchemy is a process for altering those vibrations, with the goal being the transmutation of these energies in a process of material and spiritual perfection. Although the principles of ancient alchemy as we know understand them today are reputed to have been set down by the ancient occult writer Hermes Trismegistus in the so called "Emerald Tablets" around 1900 B.C., the idea of a quest for the “Elixir of Life” can be found in the earlier myths and legends of ancient China and the works of the 6th Century B.C. Chinese Taoist philosopher Lao Tzu. Indeed, the basic ideas of alchemy may have been a part of mankind’s earliest myths and legends such as the Egyptian Bennu Bird and the Greek Phoenix and may in fact be allegorical not only to ancient alchemy but modern quantum physics as well. In the end, though we know about the alchemists themselves, the early history of the workings of alchemy is mysterious and by no means straight forward. 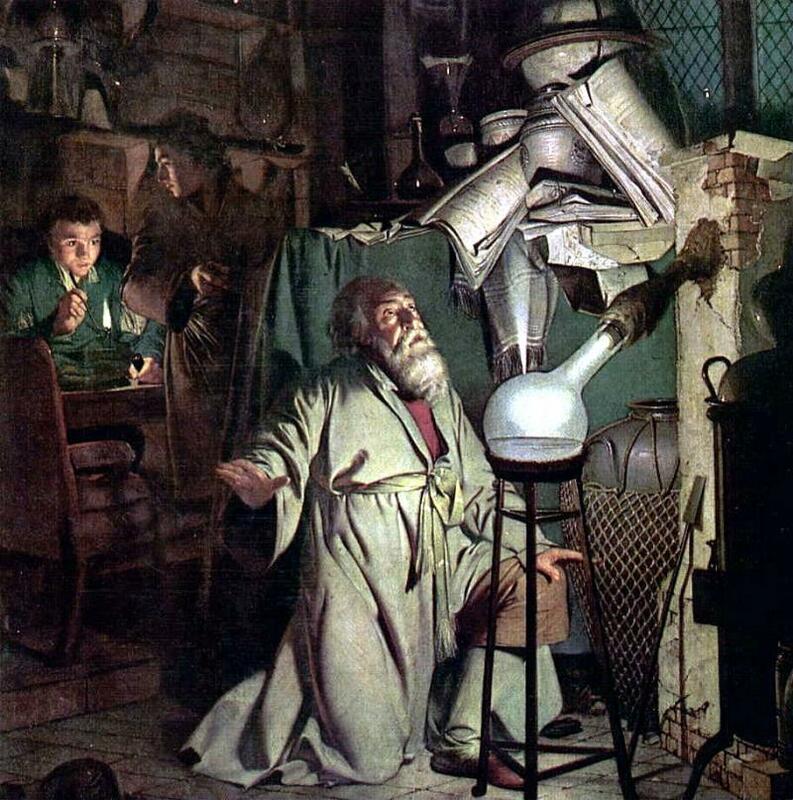 Often the workings of alchemy were made deliberately mysterious because the knowledge, which the alchemists wanted to be able to obtain, would confer onto them a degree of power and bring riches, which they had no intention of sharing and many alchemists encoded their secrets with mysterious alchemic symbols to conceal their work. Which is not all that surprising considering the lengths that modern businesses go to keep their "trade secrets" concealed from their competitors. Additionally, with the potential for wealth in the creation of gold, alchemy attracted many frauds who sought to attract wealthy patrons with false stories of their knowledge of the "Philosopher's Stone" or a rapid method of producing gold. 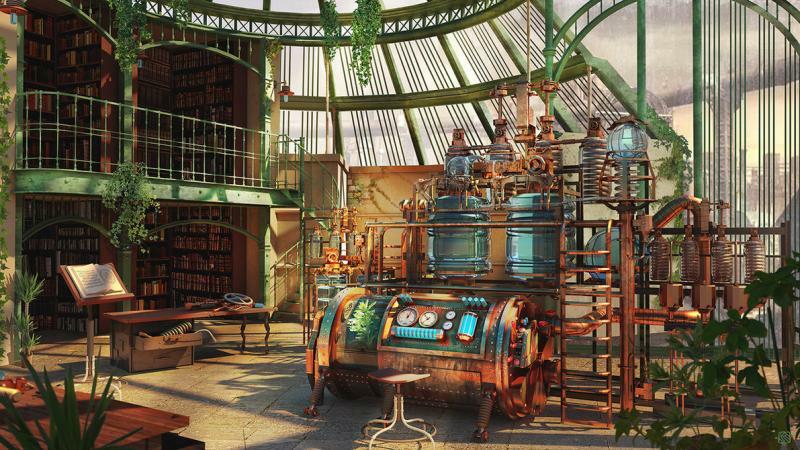 Because to the alchemists, as with modern day scientists, it was all about attracting patrons (or grants) to pay for the experiments necessary to create a new and valuable commodity and the promise of "immediate gold" was a great selling point. The alchemist who was working to combine the elements of iron and carbon into something useful and profitable could tell a potential patron that there would be gold somewhere down the line when he could finally produce steel, but that patron might want to see a quicker return on his investment and put his money elsewhere, so a little "gold lie" might be the best way for the alchemist to get his funding. The student of alchemy was left navigating a path that was strewn with both secrecy and fraud and alchemy would not begin to come out of the darkness until scientific experimentation came out of the darkness and into an "age of enlightenment" and also an "industrial age" where the funding of research and development would be recognized as a necessary part of doing business. evolve, or to solve problems of inner disharmonies." Typical of the pitfalls that faced the early alchemists was the work of English philosopher and scientist Roger Bacon. Born in England in 1214, Bacon became a Franciscan friar around 1257. Although Bacon is remembered today more as a physician and scientist, whom we are indebted to for many scientific discoveries in astronomy, mathematics and science, it was his interest in alchemy that brought him first renown and then repute during his lifetime. Bacon believed in the "Philosopher's Stone" and the "Elixir of Life" and when these beliefs were denounced by the Church he was tried for this "heresy" and imprisoned from 1277 to 1291. It would be in England though that alchemy would come out of the darkness of ignorance and persecution and begin to be viewed in a more scientific light. In 1534 King Henry VIII, for more personal than spiritual reasons, abolished the Roman Church and established the Church of England, removing the threat to alchemist from the Pope’s inquisitors. In this freer thinking environment Henry’s daughter and eventual successor Elizabeth I became so profoundly affected by the works of astrologer and alchemist Dr. John Dee that her patronage allowed the mystical sciences to flourish again. "The more Newton's theological and alchemical, chronological and mythological work is examined as a whole corpus, set by the side of his science, the more apparent it becomes that in his moments of grandeur he saw himself as the last of the interpreters of God's will in actions, living on the fulfillment of times." The names of the ancient alchemists are not all lost in the past. School children throughout the world know the work of the 14th century alchemist Nicolas Flamel. In Harry Potter and the Sorcerer's Stone, it is Flamel’s book on the “Great Work" (gold making), that helps Harry uncover the mystery of the Stone. School children also know the work of another great alchemist, but few realize that they know it. Although better known for being a scientist and mathematician who established much of the mechanics of modern science, Isaac Newton was a well known alchemist of his time period (1642-1727), as Flamel was in his. As a “scientist”, Newton was the holder of the Lucasian Chair of Mathematics at Cambridge University, (the same chair later bestowed on physicist Stephen Hawking), and though Newton is best known as the scientist who “discovered” gravity when an apple fell on his head, his writings published long after his death seem to indicate that Newton’s scientific work done at the University was most likely to provide a source of income to further his work in the occult sciences. Newton was an astronomer, but that interest came out of his work as an astrologer. For thousands of years up to and during Newton's time astrology and alchemy were one and the same, in the same way that alchemy and chemistry had been. Newton was also convinced that he had been chosen by God to rediscover the wisdom of the ancients and even to uncover the secrets of the Bible and other ancient writings and he achieved enough success in his experimentations to persuade him that he was on the right track. Newton believed, for example, that ancient Greek and Roman mythology contained encoded alchemical recipes and a path to the philosophers' stone hidden alchemical secrets. One myth, (found in Ovid's Metamorphoses) told the story of how Venus and Mars, locked in an illicit embrace, were trapped in a bronze net by Venus's husband Vulcan. Alchemists traditionally used planetary names for the elements naming iron Mars, copper Venus and the heat of the forge Vulcan. Newton followed this process and by combining the elements represented in the myth he was able to produce what is called “the Net”, a purple alloy with a striated, net-like surface. 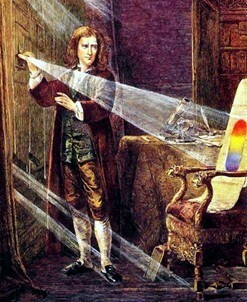 Much of Newton's writings on alchemy were lost in a fire in his laboratory and after his death in 1727 the British Royal Society deemed that most of his other writings were "not fit to be printed", so the true extent of his work in alchemy and the occult was undoubtedly larger than is currently known. However, most scholars now concede that Newton was first and foremost an occultist and that the inspiration for Newton's theories on light and gravity came from his alchemical work. To Isaac Newton, 'Alchemy' and 'Chemistry' referred to the same pursuit, namely the study of natural and material sciences by empirical analysis and it was for this “scientific” approach to his studies that he is remembered as the revered founder of modern science. Yet, in examining Newton’s writings one discovers that many of his “scientific” studies contain language and terminology more typically associated with occultism, than with modern science. Newton’s idea of science did not represent an exclusively temporal and secular approach to the revelation of truth, but also a search for a divine revelation of truth beyond the scope of ordinary human vision or reason. As John Maynard Keynes would later observe; "Newton was not the first of the Age of Reason, he was the last of the magicians." materia, the so-called chaos, into the active principle, the soul, and the passive principle, the body, which were then reunited in personified form in the coniunctio or 'chymical marriage', the ritual cohabitation of Sol and Luna. By the beginning of the 20th century, science was making seemingly “magical” discoveries regarding the intrinsic nature of the material world. Einstein’s theory of general relativity produced new ideas on the nature of time, from both a material and spiritual perspective, revealed through the language of abstract mathematics. Science had once again crossed the line and back into the realm of metaphysics. 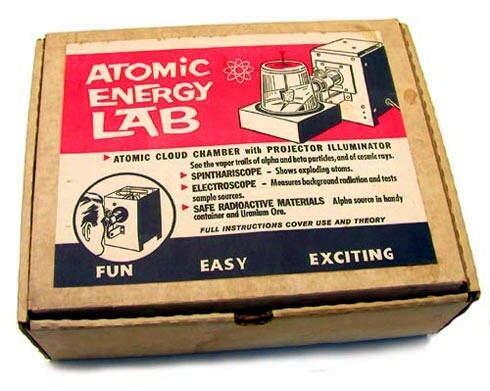 Nuclear fission was in fact an example of alchemical transmutation of matter into energy and the theory of quantum mechanics revealed paradoxical ideas regarding the nature of existence that could not be answered by either the “scientific” or “mystical” approaches alone. Modern-day psychologist Carl Gustav Jung’s doctrines on the alchemical symbols as archetypes of experience within the human psyche were in accord with the Taoist philosopher Lao-Tzu’s mystical ideas of "internal alchemy". Seen from this perspective of history, the scientists of today are becoming indistinguishable from the alchemists of yesterday and the modern analytical psychologists no different from the ancient mystical philosophers. They are caught up in up in a metaphysics conundrum with no way out. 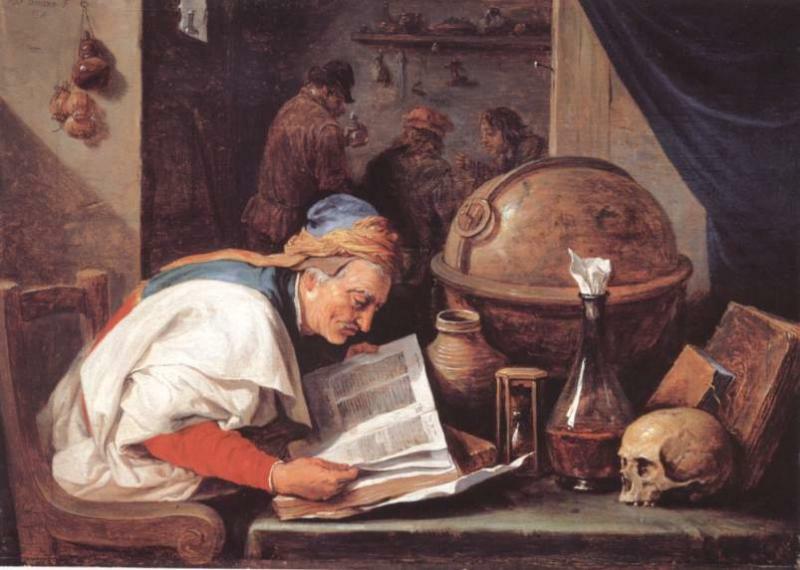 The work of present day secular scientists is validating the ideas of the ancient alchemists. Science and religion are reaching the point of armistice, if not the total cessation of hostility.